Discipline is not a bad thing. In fact, it’s a necessary thing, if you understand it in terms of correction or protection (its true purposes). Sadly, the very word has been contaminated by its association with something diametrically opposed to discipline—abuse. It is extremely common for abusers to try to hide their crimes under the once untainted label of discipline. Here is biblical wisdom: “My son, do not despise the Lord’s discipline or be weary of his reproof, for the Lord reproves him whom he loves, as a father the son in whom he delights” (Proverbs 3:11-12). And, a testimony from the Psalmist that discipline’s role is to protect. “Blessed is the man whom you discipline, O Lord, and whom you teach out of your law, to give him rest from days of trouble, until a pit is dug for the wicked” (Psalm 94:12-13). Discipline, while the world is yet unfallen, exists for the sake of what seems its very opposite—for freedom, almost for extravagance. The pattern deep hidden in the dance, hidden so deep that shallow spectators cannot see it, alone gives beauty to the wild, free gestures that fill it, just as the decasyllabic norm gives beauty to all the licences and variations of the poet’s verse. The happy soul is, like a planet, a wandering star; yet in that very wandering (as astronomy teaches) invariable; she is eccentric beyond all predicting, yet equable in her eccentricity. It is precisely because of this, the genuinely noble and affectionate character of genuine discipline that I was so deeply repulsed (and moved) by the following story. It comes from the fine journal, First Things. you smashed his face into the floor. And those were just the better years. What shall you find at heaven’s gate? who haunts them still in all their dreams? and beat them feral, stomped them wild. Who spares the child and breaks the rod. 31 responses to Discipline or Abuse? Until I had a kid, this was largely theoretical for me. But as a teacher, I see a newish trend. I think any roadblock, and bump in the way, and difficulty or opportunity to struggle–anything difficult is a kind of evil. It could be a minor evil, but evil nonetheless. It makes teaching tough, because as teachers we not only draw people in, but bend them into the way. It can be painful. I don’t even like giving a “C”, let alone a D or F.
We are at an intriguing cultural moment. Yes, you educators experience unique challenges and responsibilities. With a wife and son who are teachers, and my other two children homeschooling, I’m acutely aware of that. My prayers are with you. Negative behavior comes from witnessed/experienced negative behavior usually. Some kids have experienced such horrors at home by the time they get to school, they are already set up for failure in society. That being said, reasonable boundaries and reasonable behavioral expectations are important to understand and to follow. Reasonable consequences for actions. That “reasonable” part seems to be the tightrope. So many people are hair trigger rage-aholics or “too tired” to deal with kids being kids that good judgment seems have left the building along with a kind compassionate society. Yes, parenting can resemble walking a tightrope. Especially in terms of setting and maintaining healthy boundaries. And yes, too many people are deeply scarred by witnessed and experienced horrors. But that doesn’t mean they are destined to repeat the same atrocities. Redemption and healing are possible. And, good people can be vigilant and intervene when they see abuse. Like I always tried to tell new teachers in secondary school. No matter what smile and try to say something positive even at the most surly kid – it may be the only kind word that child gets all day – especially if he’s a “trouble maker”. Incredible how many survivor kids can make it if given someone who believes in them and takes time to let them know. Teachers can truly be lifesavers to those drowning children. My wife has a great capacity for loving the least lovely people. Gee, that invites an inference I’d rather not ponder! Sigh, teachers all seem to adopt strays. Lucky one who are eternally grateful for the rescue? Hope she has a stellar bunch of kids this year. No doubt she’s real star. There is no words to describe this sorrow! I often argue with people not to judge these men who are like savages! We have no idea how they were brought up. Apart from that; we have no right! We can judge wrongdoing, but that is where our boundaries end. Yes, it’s Christlike to love the person, the sinner, even as we judge the wrongdoing itself. A bit of friendly grammar discipline: it’s = it is, its = possessive. I have yet to raise children, but in training my dog I’ve found that emotions – anger, frustration – must subside before discipline is effective. That’s a crucial factor. Emotion has a way of twisting even the purest of intentions. Even unbalanced “compassion” is capable of spoiling and permanently injuring the object of our love. Discipline carries other connotations as well. Webster’s tells us that it also can mean a state of self control or a field of study. Perhaps we should look at changing our concept of discipline to veer away from the meaning of PUNISHMENT and redirect it toward encouraging the ongoing study of our children’s behaviors (as well as our own) and recognizing that the goal of all discipline should be the building of SELF CONTROL. PHILOSOPHERMOUSEOFTHEHEDGE is very much on the right path in his comments. We need to reintroduce compassion and judgment into our interactions. I firmly believe that punishment from an external actor corrects behavior in the short run and can build resentment, anger, and the desire for “get even” in the long run. If we are to truly correct behavior, then we must build self control.Compassion for others, fostering good judgment, those are the keys to that internal discipline that creates caring, non-violent adults. Yes, we can become surrogate parents to the friends of our children (often unbeknownst to us). I’m reminded of a caregiver who worked with my wife at the Illinois Center for Autism. The woman and her husband lived in a very tough neighborhood in East Saint Louis. What kept them there, when they could afford to flee, was the fact that they were the only intact family on their block and the neighborhood kids saw their home as a refuge. It does. Not only does knowing boundaries give us peace of mind… it also keeps us from falling off a precipice. 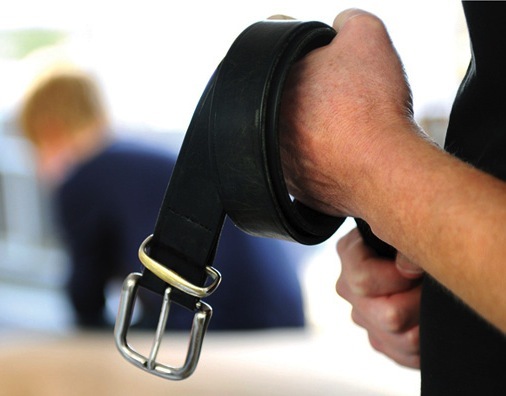 Sometimes the words discipline and abuse seem to be used almost interchangeably. Sometimes seemingly harsh discipline is necessary, Psalm 23 says “Thy rod and thy staff they comfort me.” Sometimes the ‘rod’ must be used and sometimes the ‘staff’. Yes, I agree, but always in love. That poem is heart-rending! This line: “What shall be a father’s fate . . .who haunts them still in all their dreams?” especially resounded with me. For years after my marriage I regularly had nightmares in which my parents were doing something horrible and cruel to me. The modalities differed, but I often awakened my husband as I sobbed in my sleep. My last nightmare was several years ago . . . and I just turned 58. A lot of counseling has helped me get to this point! For many years the idea of God as my “Heavenly Father” left me absolutely cold, even though I was a born-again Christian. Our pastor’s grace-based preaching has helped me greatly with that. I don’t know why this was the path God chose for me, but I hope that by sharing my experiences, others can come to terms with their abuse and learn that God IS a loving Heavenly Father. Thank you for sharing your story with us. As children we often grow up thinking that what we experienced was “normal.” It’s good for kids to see the true, healthy, loving normal so that they can recognize if they need to request intervention from others in their own environment. God bless you, Susan, and continued healing! Memories of childhood and relationships with parents can be painful and lasting. I know they are for me. Then, I do the opposite. That is a powerful lesson, but one that you successfully learned, to the benefit of your own family! I have a large amount of experience teaching parenting skills. One of the points I have emphasized is the difference between “punishment” and “consequences.” A punishment is imposed. A consequence is “what happens because.” A punishment focuses on the past. A consequence builds for the future. A consequence is strongest when it is natural – when it is the direct result of a choice, or is logically connected to a choice. A punishment is artificial and is based on your power over another person. (And what will you do when that power is gone?) Consequences share power. You point out options and then honor another person’s choices. I also teach the meaning of “discipline.” The root of the word is “disciple.” When I ask parents what the word “disciple” makes them think of, they always say it makes them think of Jesus and his disciples. The word makes some uncomfortable because it strikes them as being religious terminology. It is not. Rather, discipline is the process of “coming alongside” another person to guide and support. Discipline never tears down. It always builds. Discipline takes time. Like Jesus, in order to discipline another person, you must spend time with them. You must teach both with words and with actions. When you build a house, every decision you make is based on your goal – your plan for the finished structure. Building a child is the same process. You do not tear your construction work down when someone makes a mistake or things get hard. You focus on the finished product and persevere because the finished product is so incredibly valuable. Punishments tear down. Consequences build. Another large part of teaching parenting skills is the power of encouragement and forgiveness. These are facets of the same stone. Encouragement is pointing out success, recognizing progress and supporting efforts. Encouragement should not be mistaken for praise – which is artificial and gives an opinion. Encouragement invites a person to recognize their own successes and worth. Criticism is natural and easy, but it destroys. Encouragement builds. Encouragement is a skill that must be developed. It takes effort, but it bears rich fruit. Encouragement is free. Why wouldn’t you pour it on your child every day? Why wouldn’t you give it in great measure to everyone you meet? Forgiveness is the process of realizing that past mistakes are gone and must be acknowledged and then forgotten. This is as important for the parent as for the child. All parents have made mistakes. Most parents struggle with deep guilt over their mistakes. If you see that giving encouragement and avoiding criticism of your child will build a stronger person, then the reverse must be true. You must forgive yourself for your mistakes. You must recognize that finding the good things in yourself is equally important. What a superb lesson. Thank you, Mark. So, I cried at that last line. Thank God for God! But it’s tough down here in enemy territory.